I’m back! Pardon my absence, but I am all moved into my new apartment (as long as having an obstacle course of unpacked boxes and bins scattered throughout the whole place still counts as being moved in)! Naturally, the only room that has been completely unpacked so far is the kitchen. I missed cooking and sharing with you! I’ve wanted to make a Southwestern egg roll recipe for quite a while now, and it seemed like a great inaugural dish to break in my new kitchen. Whenever I’m scouring the web for recipe inspiration, I usually end up bookmarking like crazy, so I have a system of bookmark folders by category to try to stay somewhat organized. I knew I had several Southwestern egg roll recipes bookmarked, and when I went to check them out I realized that they were all basically the exact same recipe! That happens a lot in food blogging. Recipes get popular and catch fire (hopefully not literally). The funny part is that each of the recipes I had marked on different blogs were from different years (2009, 2010, 2011 and 2012), so I guess it was a pretty slowly building fire. After making these I can totally see why so many other bloggers have jumped on board. These could definitely rival a similar appetizer at any major restaurant chain, and since they are baked, not fried, they’re actually healthy! The blend of flavors and textures is delicious. Hearty spinach and black beans, sweet, juicy corn, gooey cheese, green chiles for a little heat, and a tasty blend of spices for a pop of Southwestern flavor, all wrapped up in a crispy on the outside, soft on the inside egg roll wrapper. Yum. I highly recommend serving these with a zippy salsa for dipping. If you wanted to add some meat to these you could certainly add the chopped, cooked chicken to the mix and I’m sure it would be delicious. 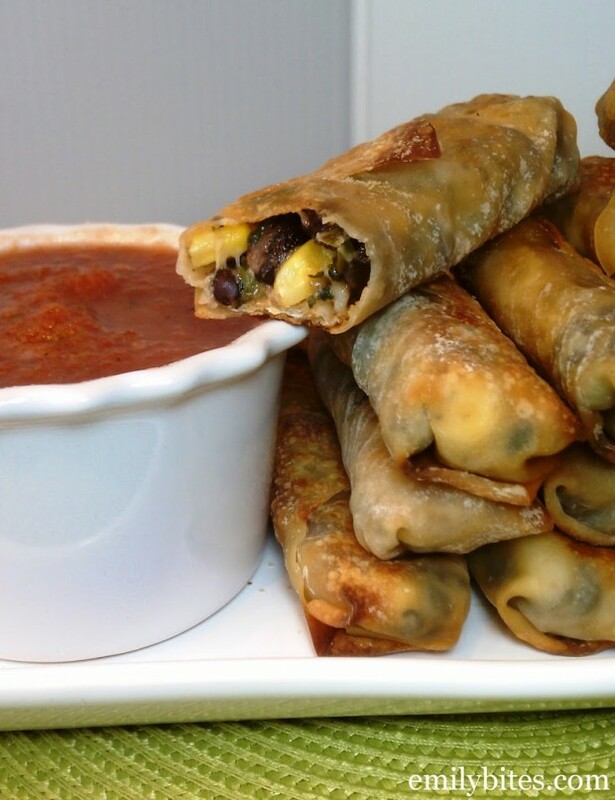 These egg rolls are perfect for an appetizer, snack, or meatless main course. I listed the points and nutrition information per egg roll so that you can choose your own serving size, depending on how hungry you are! Preheat the oven to 425. Lightly mist two baking sheets with cooking spray and set aside. In a large bowl, combine all of the ingredients except the egg roll wrappers and stir to thoroughly combine. Pour some water into a small dish and set aside. On a flat surface, place an egg roll wrapper, corner facing toward you (like a diamond) and put ¼ cup of the mixture from the bowl on the center of the wrapper. Spread the mixture in a horizontal line from the left corner to the right corner of the wonton wrapper, leaving ½ inch or so of space on each side. Fold the bottom corner closest to you up over the ingredients and give it a 90 degree roll. Fold the side corners in and tuck them as you give the filled section another 90 degree roll. Dip your finger in the dish or reserved water and lightly wet the edges of the remaining top corner of the wrapper. Finish rolling the filled egg roll over the wet corner so that it adheres. Place wrapped egg roll onto the prepared baking sheet. Repeat with remaining ingredients. When all of the egg rolls are wrapped and on the baking sheets, lightly mist the tops with cooking spray. Bake for 14-15 minutes, flipping once halfway through, until the wrappers are golden brown. Serve with salsa for dipping. I used the one from Annie’s Eats, but I also saw them on Cake and Allie, Ezra Pound Cake and Budget Savvy Diva. I’ve made these from Annie’s Eats many times, and they never looked like yours.. it looks like you fried yours..
Nope, I sure didn’t! I sprayed mine with cooking spray and baked them. They definitely don’t look fried. If they were, they’d be more crispier looking than they do…they just looked baked. 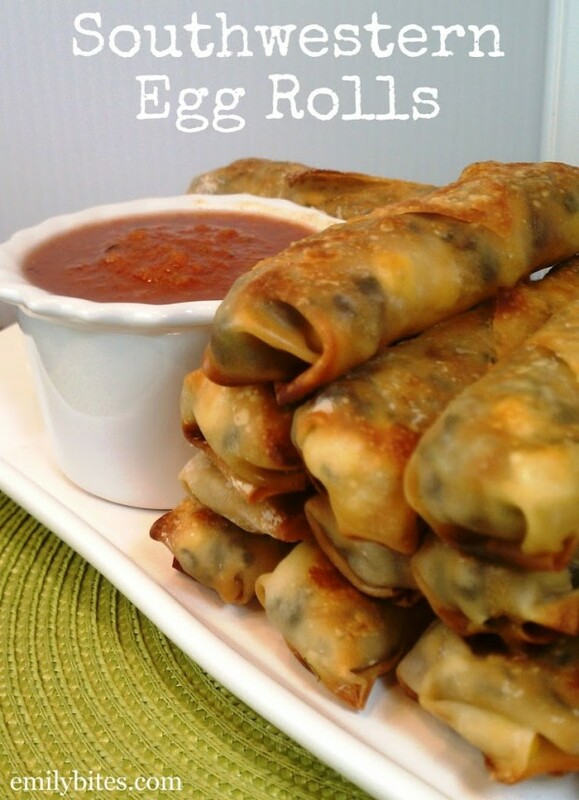 I love eggrolls and next time I’m at the store I’ll have to pick up some wrappers and make them. Can you please make more wonton wrapper recipes and perhaps some crockpot recipes? Since it’s gotten too hot out to turn on the oven?!!! Thank you!!! So glad you’re back! These look wonderful. I just became a subscriber and these look fantastic. I’ll definitely give them a try since Mexican food is one of our favorites. I’m glad you found me, Susan! I have a ton of Mexican recipes. I hope you love them! I’ve done these before without the spinach (I forgot!) and I LOVED them! I’m so glad you posted here so I can try your version. I’m glad you’re back! I am so glad that you are back. I hope you are enjoying your new home! These look so wonderful! I cannot wait to try them. Where would I get the egg roll wrappers? I’ve found them in the produce section near the mushrooms at most grocery stores. I made these over the weekend and they turned out awesome. We left off the spinach and green onions but mixed in a can of rotel diced tomatoes/peppers (drained) delicious!!! I have had this at said major restaurant chain and they were pretty good! Probably not as good as yours since they are homemade. And I like that they are baked because frying is such a mess. Bookmarking this one! I made these tonight. They are as good as the restaurant, for sure!! I used low fat ranch dip. Of course there were too many, so we wrapped the rest in aluminum foil and plan to reheat in the oven. A real success. and providing your legions of fans with more deliciousness! Hi Emily, I tried these tonight, and they were great. My husband loved them too. I must tell you that I -hate- to cook, but somehow, I want to try all of your recipes! Amazing, I tell you! Thank you for making diet food wonderful! Anyone know if these hold over well? They’d be good to serve at my bachelorette party and I’m wondering if I can make them the day before. Ohhh wow! These were amazing. I put chicken in 1/2 of them for my husband and he loved them. Thanks, Emily! Alright so they hold-over okay. Not “well” but decently. The wrapper gets a bit soggy. I just made sure to bake them really hot. They got really crunchy on bottom but didn’t get crunchy on top. They were still DELICIOUS. I added chicken, by the way. I made them for my bachelorette and the 7 girls ate all 20 in no time. Unfortunately, it only made 20 since there were only 20 wrappers. I had a little left-over (wouldn’t have been enough for 4 more though…) so I stashed it in the fridge. But first I tried making a couple of raviolis with it out of wonton wrappers. YUM! Okay I just made them again and I realized I forgot to flip them the first time… lol That’s why they didn’t get crunchy! I added not just chicken but also some leftover pork this time too. They look AMAZING and I can’t wait to feed them to the hubs! I made these last night and my boyfriend said they may be the best thing I’ve ever made him. I added ground chicken to add protein for a main meal. They were really delicious! Made these tonight and they were wonderful!!!!! I loved these! They were so easy to make and so good! I made these tonight and added some chicken. I served them with low fat, reduced calorie Ranch dressing and they were great! These were great. We also added some chicken and made a fresh salsa to put over them. Baked them and they turned out nice and crisp. My children even liked them. Thanks for all the recipes. Congrats on the daily buzz!!! Made these tonight and absolutely loved them! Bought eggroll and wonton wrappers specifically for your recipes – this was the first one I tried and we loved it! Hubby has requested these be added to our dinner rotation and with how WW-friendly these are, I’m happy to oblige! I made these for company and everyone loved them! I was so excited! Ive never used eggroll wrappers before, but now I am thinking of all different things I can stuff inside of them! This was the 2nd recipe I tried of yours. I loved the zucchini tots too! You have such creative recipes..thanks for sharing! Made these last week and they were a hit @ my house! I added shredded chicken to the mix. Super yummy! They freeze very well!! I usually bake the eggrolls until they just turn brown, then take what I am going to freeze off the cookie sheet, and put what I am using that night back in to finish. That way, I can cook them thoroughly when I am at work without burning them. I wrap them individually in plastic wrap and then put them in a freezer bag. Alane Dietrich Dunn, huge fan of EmilyBites!! Made these last night and they were great! I might half the amount of spinach and add some bell pepper and onion next time. I’m trying to keep track of my sodium intake, do you have an idea how much sodium is in each roll? Thanks! I’ve made these twice in the past week. Yum Yum. They are seriously a favorite now. I made these the other night. The whole family gobbled them up they are so DELICIOUS! Love your recipes! I made these for lunch today, and they are delicious. There’s only one small problem. I can’t stop eating them! Oh my, I am SO excited to have found this recipe and your site! I used to get Southwestern egg rolls all the time at a chain restaurant, but had to stop when my stomach would no longer allow me to eat deep fried foods. I haven’t had them in about 7 years. I nearly skipped over this recipe, after I saw the photo I assumed they were deep fried. I am so so so excited they are not! Thank you!! Oh and I thought I’d add… I did not have black beans on hand so I used white cannellini beans instead. It did not change or take away from the “southwestern” flavor at all! I accidentally added 1# lean turkey sausage to this recipe and it was fantastic! Only adds 1 point to the WW Points Plus value. Accidentally, you ask? I had written down and purchased ingredients for a couple of your recipes, and when I came home to make one, I added the sausage to the egg roll pile. I just made these, but I had to make quite a few adjustments. I used canned everything because I already had that, except spinach, there was no spinach included. I could not find egg roll wrappers in the tiny town I live in, so I used frozen filo dough. The dough was so delicate it just fell apart and I have little pieces of dough everywhere. I was able to get two giant burrito style rolls onto a baking sheet and into the oven, but I couldn’t motivate myself to try an make anymore. It makes excellent chip dip though! Just made these with a spin!! I put chicken tenders in a crockpot with a jar of salsa, peppers, onions and mushrooms on high for 3 hours. Then put in collander to drain liquid and cooled. Rolled in egg roll with fat free cheddar cheese and baked on each side for 7 min.. Used sauce that was drained as a dip. Was delicious and 2 whole eggrolls were 4 points wwp. YUM. Even the husband person said yum. He wants me to add some meat next time. I just made these…omg so good! I substituted finely chopped sweet red bell peppers instead of the spinach. I was a huge hit! Made these for dinner again! Actually, we could’t wait for dinner to eat them. Really delicious! Made these last night for a ladies night. they were a big hit!!! could hardly keep my hubby and son-in-law from gobbling them all before party! will definitely make these again and again and again……. Can these be frozen? Should they be baked all the way first then frozen or not baked at all? I personally never liked egg rolls, they tasted bland. Now your recipe has rekindled a desire. I found this recipe on Pinterest about a year ago. I’ve made these now a dozen times- they are so delicious! I always get so many compliments on them. It’s a great way to get my husband to eat veggies and is one of the few dishes I make he specifically requests. THANK YOU for posting and sharing. Love this recipe.. Thank you. Have made several times and it is a family favorite. I tried adding a litle cream cheese, cutting back on regular cheese and it is delish. If I mixed a small amount of salsa and fat free sour cream into the mix, would it make it too liquidy? 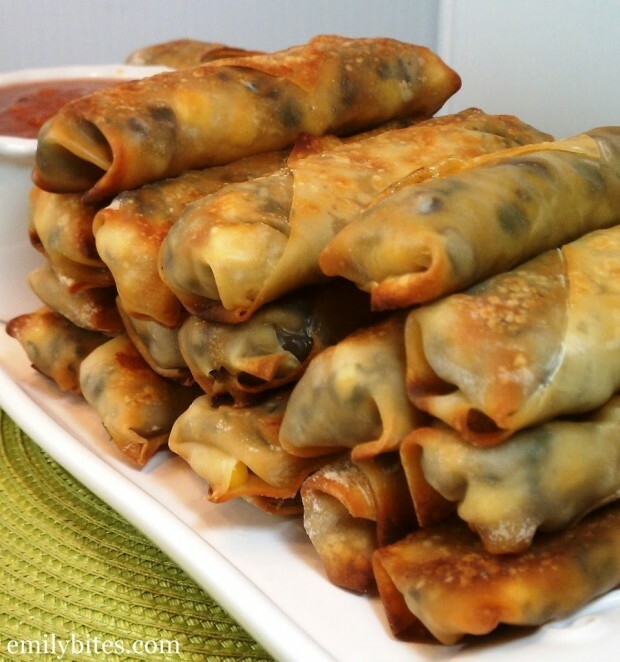 Your traditional egg roll recipe used 3 tbsp. hoisin sauce, so I assumed it would have the same amount of wet ingredients. I was just wondering why you used frozen spinach and thaw it, rather than fresh spinach? I’m looking forward to trying these. Thanks! *shrug* it’s already chopped and wilted and it’s convenient to keep on hand. You can certainly use fresh if you prefer. what is the ww points?? The WW points and nutrition information are at the end of each recipe! Good Morning Emily. Your website is my most favorite find 🙂 I’m anxious to try the southwest egg rolls and the pizza logs. Do you know if that is something that I can make the evening in advance and bake the next day? I’m afraid of sogginess… Thanks! When I put this recipe into my the recipe builder, I keep getting 3 points, not 2. Am I doing something wrong? Made these for Super Bowl last night and they were a huge hit! Has anyone ever frozen these (or any of the eggroll recipes!) BEFORE baking them? I wonder if you’d have to thaw before baking or if you could just toss them in the oven frozen and bake longer. I’d like to make a double or triple batch and just keep them on hand! These look so delish. Do you think that these could be made and then stored in the freezer and reheated as a snack? I love these! Has anyone cooked them in an air fryer?